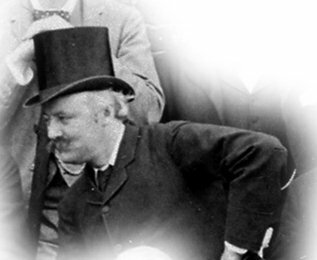 Charles Hubert Hastings Parry was born on the 27th February 1848 in Bournemouth, the son of a wealthy amateur artist. He was educated at Eton and Exeter College, Oxford. Greatly gifted as a musician he studied with the English-born composer Henry Hugo Pierson in Stuttgart, and with William Sterndale Bennett and the pianist Edward Dannreuther in London. Coming from a wealthy background and marrying a rich wife he never needed to earn his living. None the less, he joined the staff of the Royal College of Music in 1884 and was appointed its director in 1894, a post he held until his death. He had great personal charm and was a highly successful teacher of composition. Among his pupils were Vaughan Williams, Gustav Holst George Butterworth and Herbert Howells. In 1900 he succeeded John Stainer as professor of music at Oxford University, a post he held until 1908 when he retired on the advice of his doctor. He died on the 7th October 1918 and was buried in St Paul’s Cathedral. His first major works appeared in 1880: a piano concerto and a choral setting of scenes from Shelley's Prometheus Unbound. The first performance of the latter has often been held to mark the start of a renaissance in English classical music. The ode Blest Pair of Sirens (1887) established him as the leading English choral composer of his day. He wrote many choral and orchestral works including an Elegy for Brahms (1897). His later music includes a series of six ethical cantatas, experimental works in which he hoped to extend and develop the traditional oratorio and cantata forms. These, though admired by Elgar, were generally unsuccessful with the public. In the last decade of his life he produced some of his finest works, including his famous setting of William Blake’s poem Jerusalem (1916). Parry was particularly influenced Johannes Brahms, and has even been called “the English Brahms”. He adopted a powerful tonal style, and established an English choral and orchestral tradition that greatly influenced later composers such as Elgar and Vaughan Williams. He was a major force in establishing art music at the centre of English cultural life. The English Suite is a collection of pieces for string orchestra that were published shortly after Parry’s death. The prelude is a lively dance in ternary form with a distinctive English folk idiom. The prelude from Parry's English Suite was performed by the strings of the Portobello Orchestra on the 24th March 2007 and 23rd June 2007. The conductor was Anthony Weeden.